Many people have asked us where to find a listing of protest actions against Trump and inequality in a central location. So many asked we considered building out a calendar on our own. That job was daunting, which is why we were glad to discover (thank you Michael Moore!) 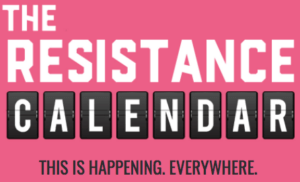 The Resistance Calendar. It is a clearinghouse for information about marches and demonstrations provided by organizers. If you’re looking for a collective action in your area, you may find it here. If you’re an organizer looking for people to participate in a march or demonstration, make sure to list it here.